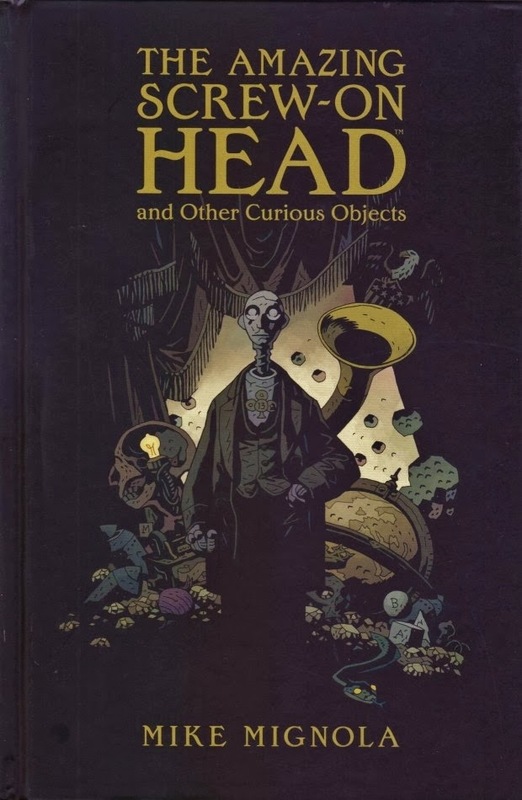 The Amazing Screw-On Head and Other Curious Objects (2010) collects Mike Mignola’s eponymous Eisner-winning one-shot and a number of short stories, including “The Magician and the Snake,” which he co-authored with his daughter Katie, then seven years old. In the title story, President Lincoln enlists Screw-On Head to thwart the plans of the nefarious Emperor Zombie. In many ways, Screw-On Head is very typical Mignola: great quirky characters, fantastically atmospheric art, and light and minimalist plotting and stories. There are some obvious similarities between numerous Hellboy stories and Screw-On Head, although the latter is decidedly campier. It’s also extremely amusing, and it’s remarkable how effectively Mignola juxtaposes his dark gothic imagery with silly dialogue. Mignola states in the notes that “There are no untold Screw-On Head stories,” and he’s absolutely right – he does everything he needs to do with the characters, scenarios, and genre in this single comic. In broad strokes, he accomplishes quite a bit, and better this than running the ideas into the ground. The other stories in this volume are only peripherally related, if at all, to Screw-On Head. The heartwarming (and Eisner-winning) “The Magician and the Snake” is popular with fans, but my favorite of the rest of the stories is “The Prisoner of Mars,” which shares the title story’s manically tongue-in-cheek tone. The others are enjoyable, if light on storytelling punch. Fair warning: this book is 104 pages, but a large chunk of that (close to 20%, maybe) is sketches and pinups. It’s an extraordinarily quick read. Short as it is, with great atmosphere and entertaining stories, The Amazing Screw-On Head and Other Curious Objects is another solid offering from Mignola.